Secure her keys with a graceful and beautiful key chain that shows just how much she means to you! 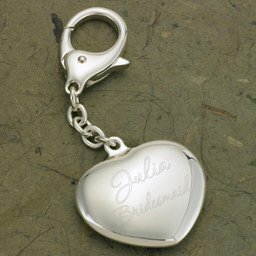 This elegant silver-plated heart charm is attached to a key chain with lobster clasp, so it can be easily secured to her purse or another key ring. The heart measures 4 1/8" across and can be personalized with two lines of text (up to 10 characters per line).